Sara Hoskinson Frommer, author of Murder in C Major, Buried in Quilts, Murder & Sullivan, The Vanishing Violinist, Witness in Bishop Hill, Death Climbs a Tree, and Her Brother’s Keeper, lives in Bloomington, Indiana. For many years the Frommers owned woods in beautiful Owen County, Indiana, but it was local coverage of tree sits in Bloomington and in Yellowwood State Forest that suggested a tree-sitting mystery. A veteran of the Bloomington Symphony Orchestra’s viola section, Sara also has played for Gilbert & Sullivan productions in Bloomington and is a self-taught quilter who sleeps under her own creations (and who did indeed quilt the quilt on the Buried in Quilts ebook cover). These days she tutors an adult new reader in the VITAL program of the Monroe County Public Library. She is a member of Sisters in Crime and has served on the board of directors of Mystery Writers of America. Born in Chicago to Hoosier parents, she grew up in Hawaii and northern Illinois. She went to high school in Kewanee, Illinois, a few miles from Bishop Hill, which in those days was little more than a wide spot in the road. She had no idea of its history, much less its potential as a site for a mystery. She earned degrees in German from Oberlin College and Brown University, and studied briefly at the university in Tübingen, Germany. She taught German as a graduate teaching assistant at Brown. She has worked with a transportation economist, ethnologists, and foreign exchange students (having been an AFS exchange student to Germany herself). She was a writer and later senior editor at the Agency for Instructional Technology in Bloomington. 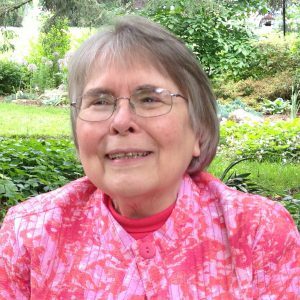 In addition to her mystery novels, she is the author of Kaleidoscope: A Collection of Stories, 16 very short, easy-to-read books of fiction for adult new readers, published by Laubach Literacy International’s New Readers Press. Five of them are mysteries. Joan Spencer, the viola-playing sleuth in Sara’s novels, doesn’t go looking for trouble, but it keeps falling in her lap. In Murder & Sullivan, the amateur musicians of Oliver, Indiana take on Gilbert & Sullivan’s comic opera Ruddigore. Joan witnesses the onstage murder of one of the “ghosts” from her spot in the pit orchestra. That’s after she’s rescued a child from a tornado. In Witness in Bishop Hill, Joan visits the tiny Swedish-American village where Fred Lundquist grew up, little expecting that Fred’s mother will witness a brutal murder or that they will have to protect her until they find the killer she can’t tell them about. In Death Climbs a Tree, Sylvia, the tree-sitting violinist from the Oliver Civic Symphony, crashes to the ground, right at the feet of Joan and her son, Andrew. And when Joan discovers evidence that points to murder, she’s afraid for Andrew, who has taken Sylvia’s place. And then it’s time to marry off Joan’s daughter, Rebecca. But nothing is simple in Joan’s life, as we see in Her Brother’s Keeper when her long-distant brother shows up early for the wedding.